Get Chainsaw Safety certification online now! If you plan on working at a job site that involves chainsaw use, it’s critical that you have chainsaw safety certification. Whether you’re looking to boost your resume for future employment or your current job requires chainsaw safety certification, our fun 75-minute online course is a must. When you witness the power a chainsaw has to cut down a tree, you instantly realize the respect that this tool should be shown by all who are trusted to wield it. Think you have what it takes to be a chainsaw operator? Get your chainsaw safety certificate right now — and have a good time doing it, thanks to the fun and high-quality instruction provided by the experts at Velocity Training. Through a variety of engaging chainsaw training safety videos, animated diagrams, and interactive activities, you’ll learn how to operate a chainsaw safely and effectively. A chainsaw is an amazing instrument, but it needs skill and knowledge to use properly. Whether you’re planning to cut down trees or construction materials such as HDPV pipe, Velocity Training will teach you everything you need to know about chainsaw safety and general operation. How Do I Get My Chainsaw Safety Certificate of Completion? Ready to get your Chainsaw Safety certification for Alberta or any other province for an upcoming job? Good news — there’s never been a better time to take care of your Chainsaw Safety certification in a way that’s convenient, interesting, and gets you ready and compliant for your next job! At the end of our approximately 75 minute course, you’ll simply print out your certificate as proof of full completion of your Chainsaw Safety requirement. What are you waiting for? 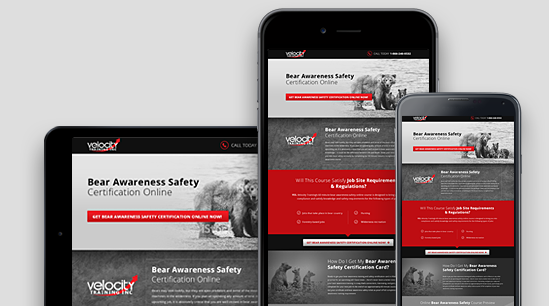 Take care of your Chainsaw Safety certification quickly and easily with a fun, engaging online course from Velocity Training!